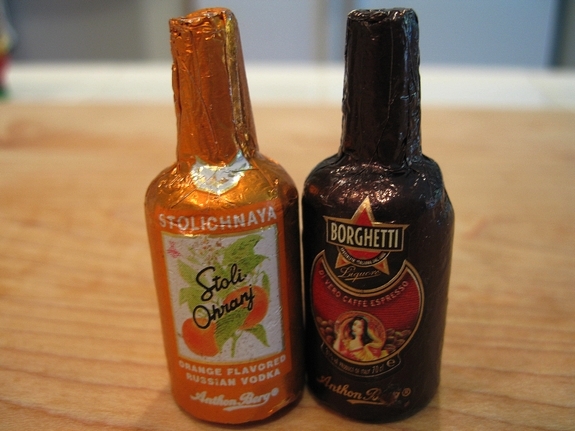 You all remember Mr. Stoli Ohranj and Borghetti? If you don’t know who they are you can catch up on their tragic life tale here. For those of you who do remember their tragic life, well, it is time to catch up on what they have been doing since the loss of their nine children. 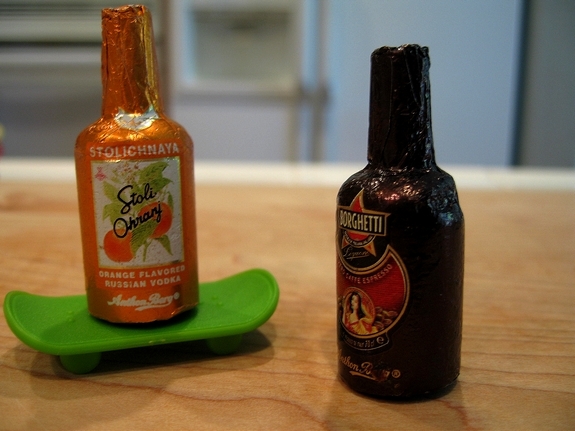 It has taken a while for Mr. Stoli Ohranj and Borghetti to get themselves back into any sort of groove since their unfortunate life altering events. Every day they have been trying to pick up the pieces of their lives and move forward; that’s what their children would have wanted. Mr. Stoli Ohranj took up skateboarding to pass the time while Borghetti just hung out on the sidelines as her heart ached desperately. Mr. Stoli Ohranj had a cousin, twice removed on his mother’s side living in Alabama. This cousin had recently married and Mr. Stoli Ohranj and Borghetti felt it was their responsibility to travel there and inform their newly married cousin of the tragedy they had suffered. Warning them they might also be carriers for the disease that was passed on to their children. Mr. Stoli Ohranj and Borghetti felt they could convince their cousin that when they decided to have children, maybe adoption would be the best option. They really wanted no one else to suffer as they had. So Mr. Stoli Ohranj and Borghetti packed up the car and drove the long drive to Alabama to see their cousin and meet his new wife. This is Mr. Cointreau and Bacardi. They were somewhat of an awkward couple mostly due to the extreme height of Bacardi. She towered above Mr. Bacardi often causing the stares of many passers-by. In the privacy of their own home Mr. Cointreau often stood on a stool to speak to Bacardi so that he could look down on her. He truly had a complex about his height. It was very pathetic. However, even with the apparent weirdness that seemed to be swirling around their cousin’s lives Mr. Stoli Ohranj, Borghetti, Mr. Cointreau and Bacardi did have an enjoyable time talking about all sorts of subjects. Everything from the upcoming election to the real estate crisis in America. But before Mr. Stoli Ohranj and Borghetti could share with them about the disease that exists in their family tree Mr. Cointreau and Bacardi said they had an announcement to make. “I didn’t mean how, I just meant how could this have happened before we spoke with you. Oh, it’s too late now, we waited too long.” Said Borghetti. She was very sad. Months went by and the quads were born. 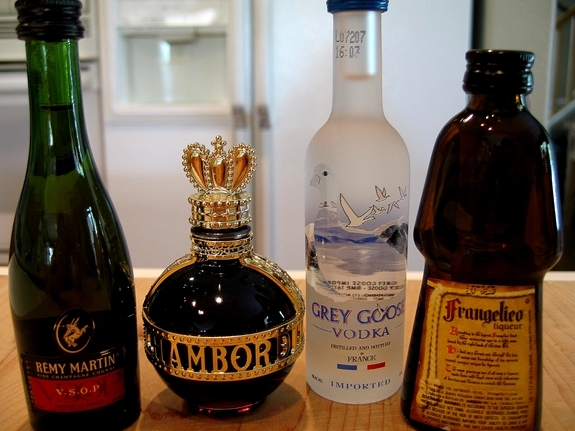 There was Remy Martin, Chambord, Grey Goose and Frangelico. Everything seemed to be going well but during some random testing a very rare disease was found in the all of the children. Further testing found that unbeknownst to Mr. Cointreau and Bacardi they were both carriers for Familial Hereditary Fragilus Silicosis. Neither one of the parents expressed this trait but both had passed on the expressive gene to each one of their children. Since their outer layer was made of silica (glass) the quadruplets had a fragility to them. One bad fall or puncture wound and they would crack into a thousand pieces. It was very sad and scary too. Mr. Cointreau and Bacardi spent every minute worrying about them but wanted them to have as normal a life as possible. All their children went on to get decent jobs that didn’t seem to pose a threat to their current condition and things seemed to be going pretty well. Grey Goose was a staunch lover of all animals. After all, he had been named after one. Grey Goose worked at the local alligator farm as the chief feeder for hundreds and hundreds of alligators. It was a good job for him. He could do his work carefully with not much thought of having to be careful due to his fragile condition. 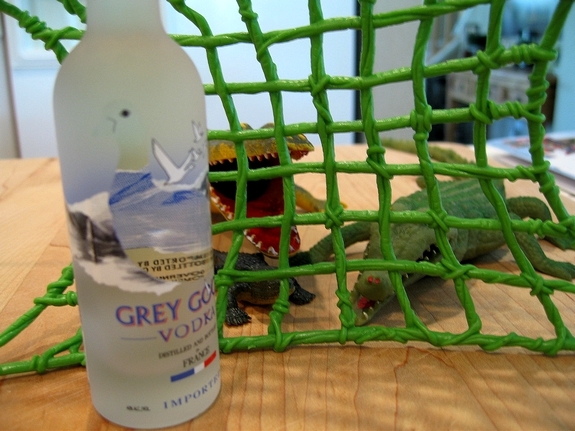 But then one night while going about his duties, Grey Goose reached too far for the lever that dropped the net from the alligator’s cage. He fell over, triggering the lever for the net to drop. 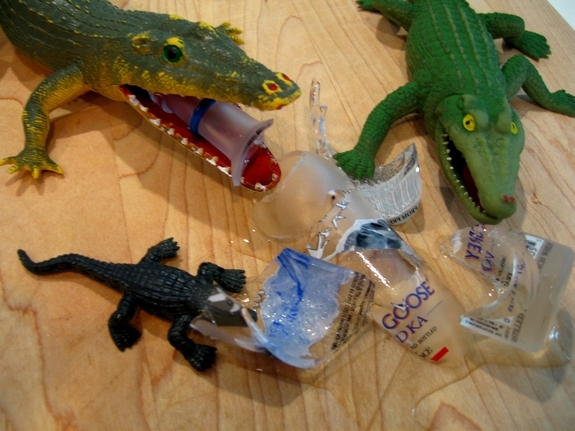 He crashed into a bazillion pieces and the alligators ate him up without incident. 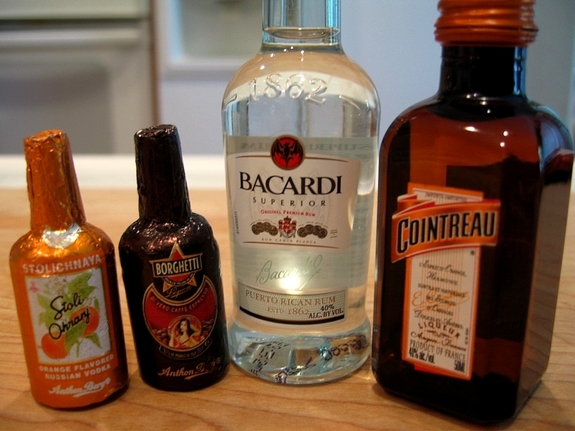 It was the first tragic loss Mr. Cointreau and Bacardi would have to endure. They remained strong as they still had three other children they loved deeply. 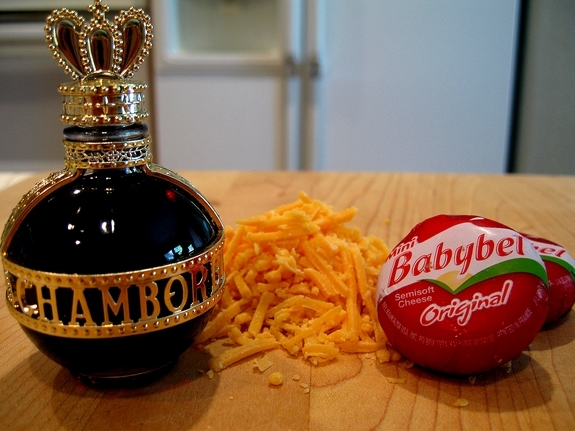 Then there was Chambord. She considered herself royalty. Even though she has always been battling a weight problem she enjoyed her life and loved her job at the cheese factory. She gave tours and loved being little miss know it all for all the guests that came to her for information. She adored cheese so it was dream job for her. The cheese factory also appeared to be a safe working environment for someone with her condition. Until one fateful day when she was giving tours to a group who had come that day. In a tragic twist of fate, two giant cheese blocks fell from the overhead beltway high above the ground floor. They clobbered Chambord and she split into many glass chards and her innards leaked her lovely red juice. 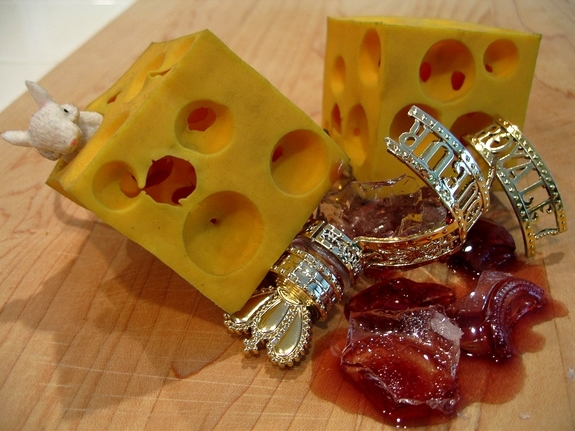 No one had ever been killed by soft cheese before. But the fragility of her condition caused this horrific loss. 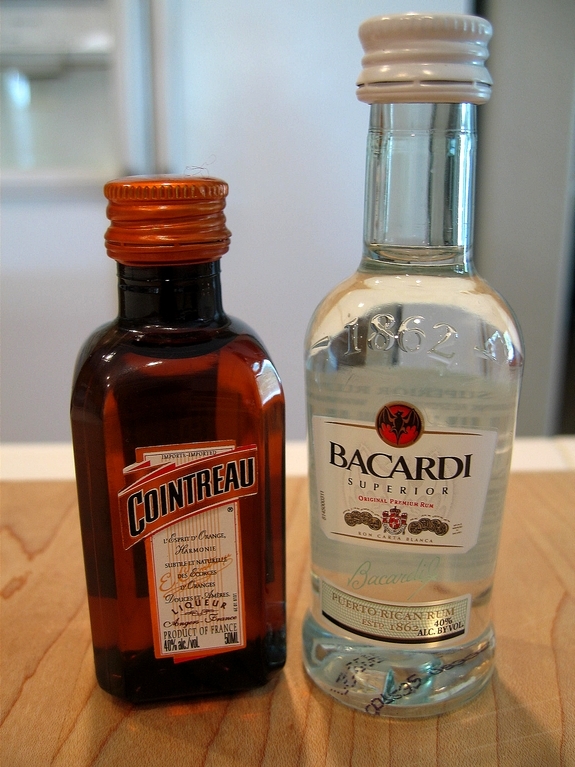 With two children gone, Mr. Cointreau and Bacardi suffered another great blow. They held on tighter to their family than ever before but it was still impossible to keep them from living and working like other people in the world. Then there was Remy Martin. He loved railroads ever since he was a small boy. The happiest day of his life was when he scored a job down at the railroad loading docks as a manager overseeing freight coming into the yard. He loved his job and was always mindful of his condition when it came to more dangerous parts of his job. One day while finishing his shift Remy Martin turned around abruptly to say goodbye to some of his coworkers. He tripped on the railroad tracks falling and shattering himself to death. For anyone else, tripping over the railroad tracks would have been just a scraped knee but for Remy Martin it was his last day at work and his life. 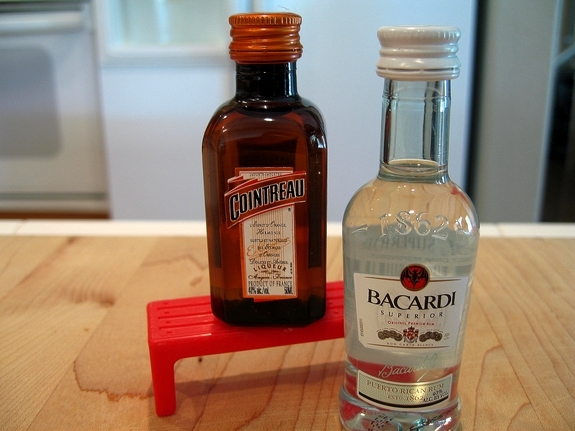 With only one child left Mr. Cointreau and Bacardi begged their youngest son to come home. To live with them where they could keep him safe. 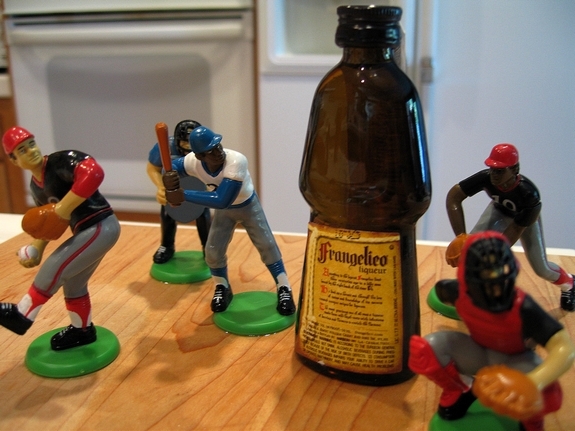 But Frangelico was a major league baseball player. He had overcome many obstacles and defied serious odds to be where he is today. The worst he puts up with now is the teasing he receives from the other players about his large size and his likeness to Mrs. Butterworth. Frangelico was an astonishing baseball player who loved the game more than anything. He somehow had been able to play for years without incident until that one day last July. 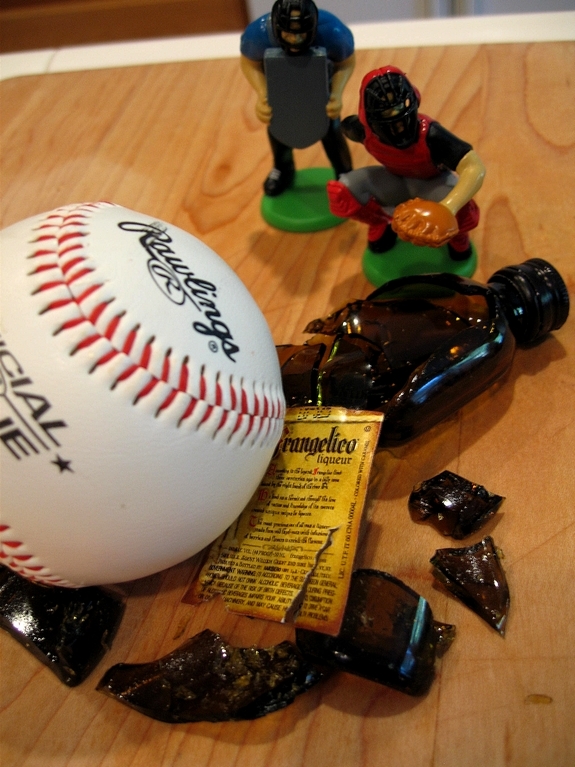 As he was up to bat in the fourth inning, Frangelico was struck by the pitcher in his lower extremities and he exploded into many, many pieces. He was honored for having died doing what he loved best. Mr. Cointreau and Bacardi were absolutely devastated and could not believe that the same fate that had befell their cousins, Mr. Stohli Ohranj and Borghetti, had also happened to them but with a different genetic disorder. Their hearts were broken and the memories of their children would live forever in their hearts and minds. I’m surprised that their long lost gay Uncle Drambuie never made an appearance. I had never seen the original post, so I went and read it followed by this one. I have never laughed so hard in my life. The story and the pictures are absolutely brilliant. 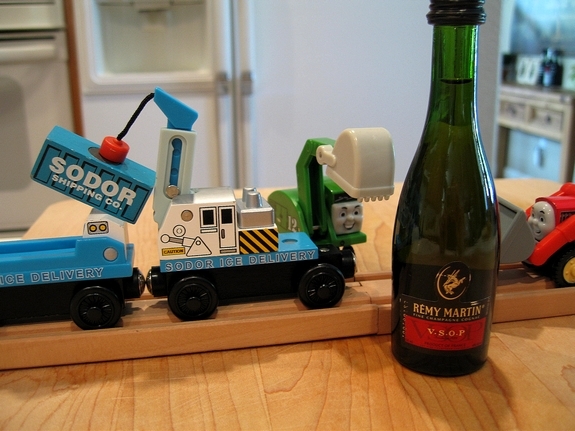 My particular favorite is how Remy Martin lost his life to the Sodor Ice Delivery train with Thomas smiling on in the back ground. So. Funny. Is this your secret to avoid being hungover? 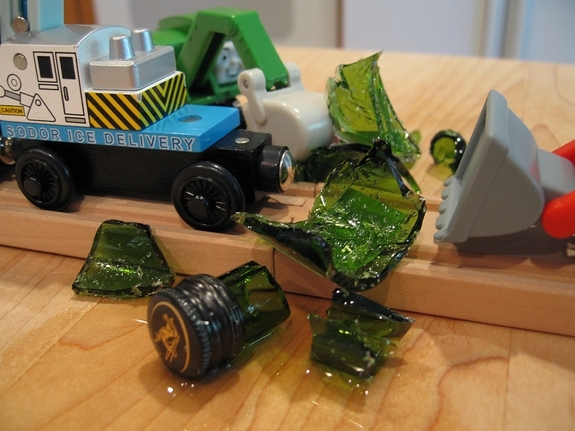 Just smash all the bottles…another fabulous story! I could read chapter after chapter of this tragedy! You do a great job of bring the charactors to life… and then shattering them mercilessly! Sooo funny! I had no idea that the liquor isle was so full of tragedy and triumph. This post has it all — love, heartbreak, loss, and very, very fine liquor. What kind of hangover do you get from drinking that many different kinds of liquor at one sitting? I recall playing with tons of those bottles as a kid ~ thinking back, I guess my folks had to have consumed them all first. I had no idea what kind of drama was being played out around me in all those tiny lives. wow…you have a lot of time on your hands. Oh Goodness! The tragic lives of booze! It is as sad as the lives of real people who love booze to much! I am gonna have my husband read this! He is gonna fall over! OMG! I think we might need to make a blog intervention here, lol. What a marvelous imagination you have you crazy girl! Oh my! I must keep Fred and Bessie from ever viewing the horrors portrayed here! I don’t know how you did it, but the 2nd act was even more tragic than the first – just like Empire Strikes Back! As soon as I saw you mention Grey Goose, I thought “oh, no! not the Grey Goose”. Although I hoped for his survival from the tragedy I knew was coming, he was the first to die. Cathy, you’ve got to keep these coming! I said it before and I’ll say it again: Your brain is a scary, scary place. YOU ARE A FREAK AND I LOVE YOU FOR IT. Where is Senior Patron in this story? Frangelico looks a little like Mrs. Butterworth. Please please PLEASE tell me no actual alcohol was harmed in the filming of this masterpiece. I just couldn’t bear it. May have to report you for alcohol abuse. Cathy you did it again! What a great mind you have. Even though I didn’t read this from the beginning this entry really was SUPER GOOD. I could figure out what I missed. Intend to go back and get the whole picture. I better have some “depends” handy because this one was so funny I laughed until I cried. This kind of humor is right up my alley. I’m so glad I boarded your taxi..it’s a fun ride lady! Oh yes now when I look at my stash I won’t look at them again in the same way.. More stories under my kitchen sink! Where is Grandpa Midori and Grandma Dagoba? It’s like a novel… the beauty, the tragedy, the love… and pictures – oh the pictures! You crazy lady – that’s what you is. But I would want to frame a few of those shots. They are fun to look at. I would just have to close off that part of my brain that can’t stand the tragedy of it all.